What if I started a church? What would be its main purpose? What would be its main function? Who would want to be a part of it? What would it be? What would being be in this church? These are the questions – they have answers – they have purpose – they are purpose. What is so odd – about starting with God? Is this not how, creation began – begins? For the believer or the unbeliever? Daily times of prayer – gee, do we have to? Do we want to? Where is our heart – if we don’t? Starting times – stopping times? Schedulality or Spirituality? Do I have to wash his feet? Hers too? Even theirs? Act or don’t act? What good does it do, if that “someone” isn’t you? Rationalizations? How are these helpful? Why do we criticize and/or kill everyone that had/has this message? Is He Creator or are we? Do we have the right – the temerity – to question Him? Can we make Him in our own image? Do we get to decide who He is – what He is? Who’s ways are like His ways? Who’s thoughts are like His thoughts? What are the things we can disagree on as a body? What are the things we can’t? What comes first – rules or love? Why did the Creator of all things give us a manual if He didn’t want us to use it to build a world? Can you turn to God from sin if you don’t know what sin is – What God’s definition of sin is? Isn’t this manual a blueprint for loving Him? Why so somber son? Does living for Him kill all your fun? What does rejoice mean? What does make a joyful noise mean? Can love exist when you keep a list? Are you a billboard for the world or for the one that made the world? If you don’t want to live like this on earth, what makes you think you would even like heaven? is it so you can get stuff and show people how favored(blessed) you are by God? Can you hide your heart from God – your motivations? Is He the fool or are you? Is your discernment superior to that of any other that is also full of the Holy Spirit? Do you follow His commands? Can you be a disciple and not do these things? Can you disciple others if you don’t do these things? Are you willing to die for your brother or sister? Have you made their problems your problems? Immersed yourself in the word? What about the sinner who stumbles? Do we love them and disciple them? Or do we kick them out??? Wouldn’t it be helpful to distinguish what they accepted as truth? What they rejected? Can we do anything but dismiss them? What about a homosexual? If he thinks it is wrong and is trying to let God have control, do we expel them? What if he thinks it is right? Are those that love the world any different? Is homosexuality a worse sin than loving the world? Can you love the world and have the love of the Father in you? Can you love God while you are hostile to Him? Do you watch TV? Do you listen to secular music? Should the temple have cable television installed in it? Would this be blasphemous? Are you not that temple? 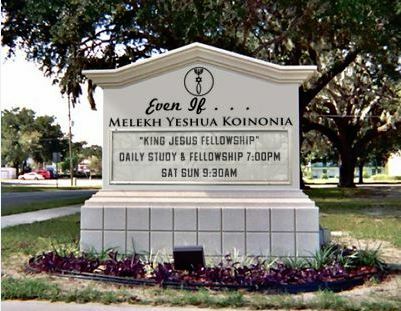 Did Yeshua sacrifice Himself on the execution stake for sexual immorality only? Is His atoning sacrifice, did he become sin that knew no sin, so that we would be able to live a worldly life with no consequences? Would this church be considered a “Seeker” church? Was the church a place for believers or no-believers? Were Christians killed for being Christians? If you lived during WWII would you take out an ad and advertise that you had Jews living in your attic? Do you think Christians did in Sha’uls time? Was it a book of covenants or testaments? Where does love fit into all of this?
. . . no, I don’t want to start a cult. This entry was posted in Poems and tagged christianity, even if, poem. Bookmark the permalink. 1 Response to What if I started a church . . . I served with a guy here locally that taught at the church we both attended at the time. He has a PhD. He wrote me in an email that he “disagreed” with this . . . .